Members of the Board of Education received a copy of your email correspondence in which you express concern regarding the transparency of the decision to hire an attorney to represent the Board of Education separate from the district’s in-house chief legal counsel. I sincerely apologize for the delay in my response to you on this matter. As new board members, we valued moving forward with our work. As the matter was discussed in public on December 12 and no contract was signed until after the Board vote, board members are in compliance with the law. We know the Jefferson County community values transparency and financial management of district resources. 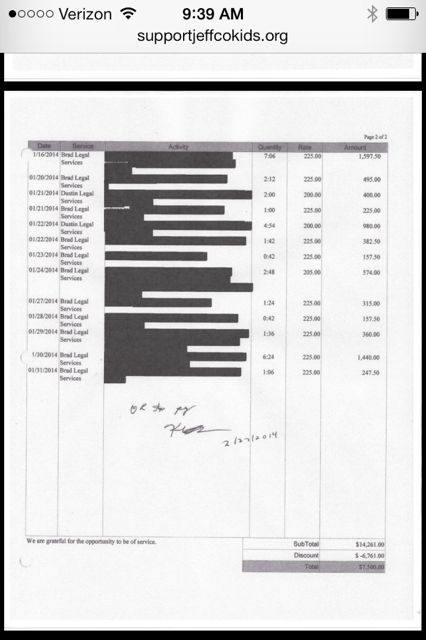 The engagement letter was signed by Mr. Witt on December 13, 2013 and the annual cost to the district is estimated to be $90,000; $7,500 a month for an estimated 30 hours of work directly supporting the Board of Education. Any work by Mr. Miller in addition to 30 hours/month will be billed at $225/hourly rate. The scope of the Jeffco board attorney’s work as outlined in the engagement letter include matters primarily as counsel to the Board: legal advice, attend and assist at Board meetings, assist in setting meeting agendas, Board packets, Board training, review Board, subcommittee and district accountability committee bylaws, policies for updates and improvements, meet individually with Board members and district staff ranging from best practices, governance, rules of order, liability, education law, and other areas of interest relevant to school boards. The district’s chief legal counsel and executive director of Employee Relations will continue reporting directly with the superintendent in support of all legal aspects of the district’s work: special education, employee and student discipline matters, school safety, hiring and termination, contracts, policy work, etc. On behalf of the Board of Directors of JCRSEA (Jefferson County Retired School Employees Association), we are writing to express our great concern and displeasure with the conduct of the three new members of the Jeffco School Board at the December 12, 2013 meeting. The urgent push to hire an outside attorney to represent you was shocking. Lesley Dahlkemper and Jill Fellman, the two continuing board members, expressed many valid questions and concerns regarding where the funding for this attorney would come from, what the total cost to the taxpayers would be, and requesting an interview/review by the entire school board prior to the hiring of this new attorney. It was appalling to watch as the three new members admitted they had conducted interviews in secrecy without involving the two continuing board members. We believe this action violates the Colorado Sunshine Law regarding open meetings. The new attorney, Brad Miller, is located in Colorado Springs, which certainly will drive up costs to the Jeffco taxpayers to have him present at school board meetings. In addition, he is involved with multiple organizations dealing with the promoting and managing of charter schools. We feel that this is a conflict of interest, and not helpful to the Jeffco School District. Therefore, we are politely demanding that you review this decision at your January board meetings. We hope that in the future you will demonstrate complete and full transparency in all board activities. The entire board as well as the Jeffco community deserves to have input prior to making any decisions. Our organization represents a total of 175 retired school employees that care very deeply about the continued strength of Jefferson County Schools. We want to insure the very best education for all the children in Jeffco. We need all of you to be equally committed to that goal.